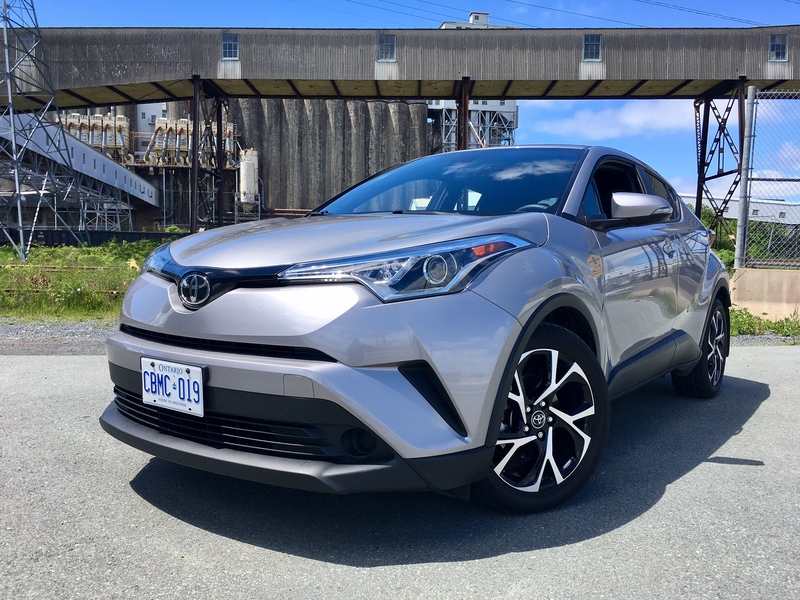 The C-HR is an all new model. It was originally developed to be housed under the Scion umbrella. Toyota recently and rightly realized that its youth oriented brand needed to be taken out back, Old Yeller-style, but it did still see some potential in two models. So they transferred them into the Toyota lineup. They are now known as the Corolla iM and the 86. The problem with folding a brand completely is there is rarely a time when the brand isn’t developing a new model, new tech or updating existing models. That was the case with the C-HR. Rather than wasting money by dropping it completely, Toyota saw an opportunity to bring it into the fold since it was missing an offering in the newish and now fiercely competitive sub-compact crossover segment. The C-HR seemed to fit the bill nicely. So now that you know how the C-HR came to be, let’s get to the thing everyone keeps talking about: its styling. As mentioned, the C-HR was always meant to be a Scion which would explain the unique styling direction. But now that it’s a Toyota, does it look a bit out of place in the lineup? And more importantly, what does John Q. Public think? The verdict, surprisingly and resoundingly, is two thumbs up. The C-HR gets about as much attention as a Lamborghini – all positive. Strangely, a lot of the positivity came from baby boomers and seniors which are markets this car was originally not meant to target. They like the chunky lines, unusual creases and large wheels. Who knew? Personally, I’d prefer something a bit more sedate that still stands out like the styling of the Mazda CX-3, but to each their own. 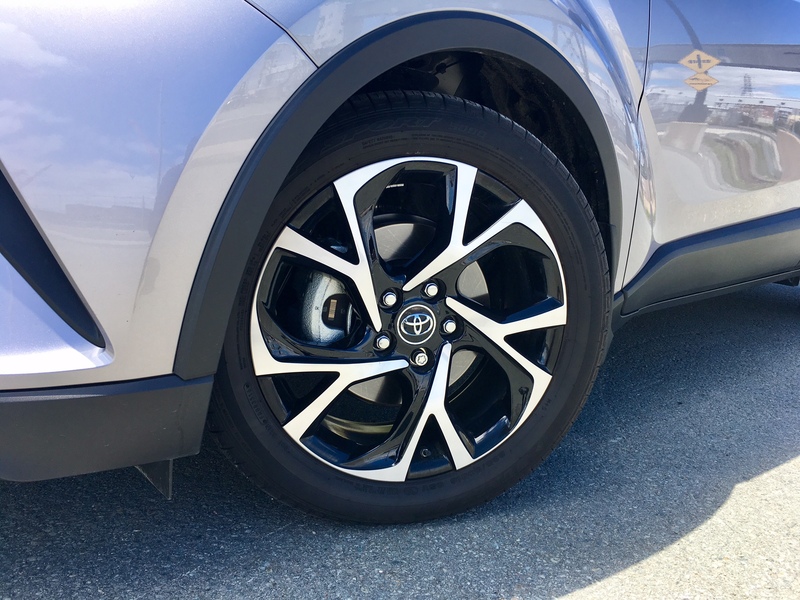 But the problem with taking a Scion and badging it as a Toyota is that Toyota customers have certain expectations, as I mentioned in my recent review of the Corolla iM. 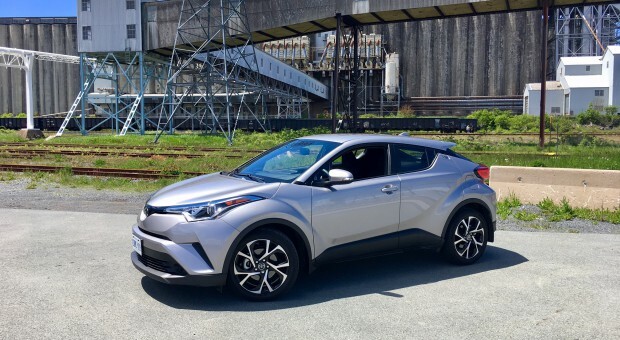 If you are accustomed expecting certain features or you just plain want to treat yourself for working hard all-year, you’ll be disappointed to learn that the C-HR, despite having two trims to choose from, has no available leather seats, no satellite radio, no navigation, no LED headlights, no sunroof and more. It’s strange, since you can pile all of those things onto a less-expensive Corolla sedan. 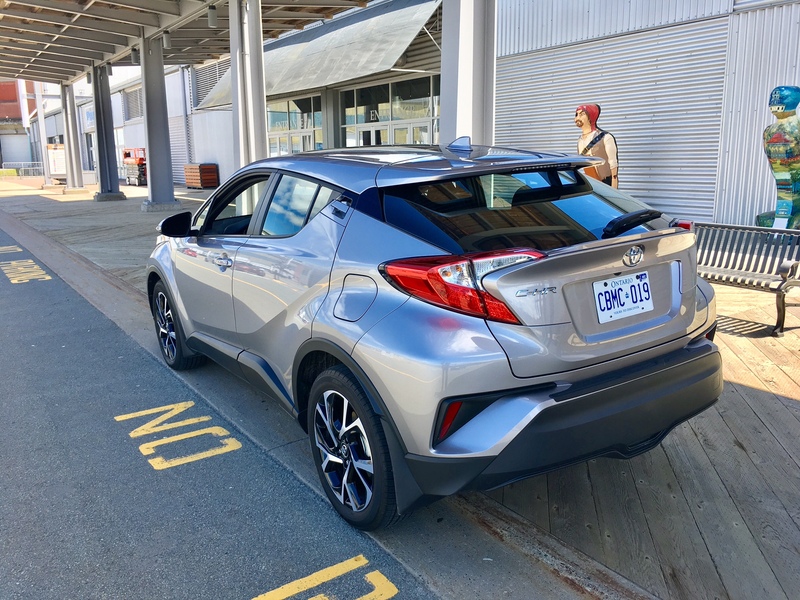 Even more strange since most of those features are either standard or available on the C-HR’s competition. But if you can get past the sparsity of features, the Toyota quality is still there. The interior styling and functionality on the other hand, isn’t its forte. The dash design isn’t symmetrical. All the buttons are angular, making them difficult to use without having to do a double take to make sure you’re pressing the right button. The volume knob is placed so high up on the dash that you might pull a muscle trying to reach it every time (though at least the C-HR has a volume knob. I’m looking at you, Honda). The back-up camera is actually housed in the corner the rear-view mirror, making it tiny, and difficult to see out of. It takes up a quarter of your rear-view mirror rendering the rear-view mirror a bit useless. And don’t even think about reversing the old fashioned way since visibility out the back is about as clear as White House press conferences. That funky styling certainly comes at a price in terms of outward visibility and rear seat room. The rear windows are small, so if you have claustrophobic kids, prepare to have to stop to talk them down from a few panic attacks. That is, if they can even get into the back seats in the first place. The door handles are placed nearly as high as the sloping roofline, putting them well out of reach of most children. Have fun opening the doors for them every single time to take them somewhere. But for all its faults, the C-HR can impress in other ways, not least of which is the chassis set up. It’s based on Toyota’s global architecture. That means it has a rigid frame and chassis that maximizes quietness and handling ability, but Toyota has pulled off the difficult trick of making the ride comfortable at the same time. Can it out-corner a BMW M4 in an S-curve? Don’t be daft. Is it as cushy as a Buick LaCrosse? Rubbish. But in terms of comfort and handling – Toyota balances them both nicely. Body roll makes only rare appearances but the steering feedback could be better. In terms of power, you’ll get one choice of a 2.0 litre four-cylinder which produces 144 horsepower and 139 pound feet of torque married to a continuously variable transmission (CVT). This is likely an adequate amount of power for most and the CVT allows you a good amount of propulsion off the line before it starts nannying in the name of fuel efficiency. In fact, around town power is quite good. It isn’t until you get up to higher speeds when the C-HR starts to feel sluggish. Dartmouth, Nova Scotia has a lot of hills which are its arch nemeses. Official fuel consumption ratings come in at 8.7 L/100 kms in the city and 7.5 highway. 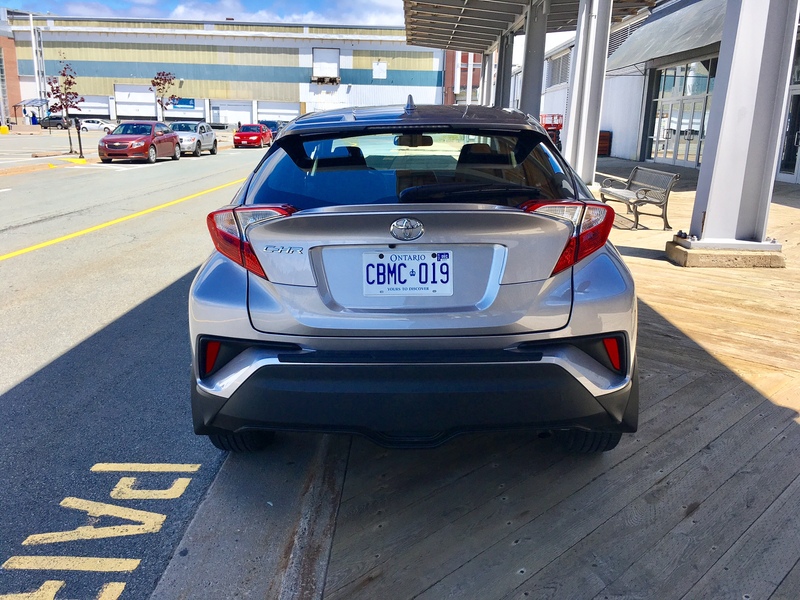 I had the C-HR performing mostly city driving duties and returned a somewhat disappointing 9.3 L/100 kms. I say somewhat because the week I had it delivered scorching temperatures so the A/C was on full blast a lot of the time, which takes a negative effect on fuel efficiency. It would have been nice to have a sunroof to leave open or tilted so that the interior didn’t get so hot while it was parked. Just sayin’, Toyota. 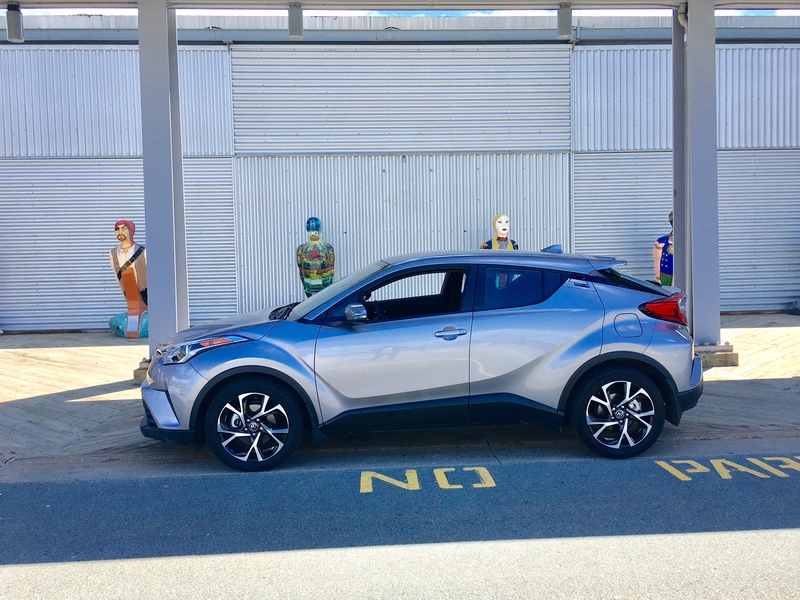 On paper the C-HR makes a good amount of sense. It’s got stand-out styling that most people seem to like, it has a quality interior, good comfort and handling balance and it is a good performer around town. But the lack of key features and poor visibility drag it down in my opinion. As does this one crucial fact: it is front-wheel drive only. That’s right, if you were looking for all-wheel drive you’ll need to look at literally any other automotive brand. Because literally every other automotive brand offers either all-wheel drive as standard or at least optional in this segment. This seems like the biggest omission of them all for the C-HR. But if you’re looking for a quiet, comfortable ride that garners attention and will likely be fairly reliable, then the CH-R is worth a look. The problem is, all of its competition is worth a look too and when you stack them next to it, the choice becomes rather obvious.